Washington (CNN) – Republicans in the House of Representatives expressed outrage with one of their compatriots on the other side of the Capitol Wednesday, questioning whether or not Texas Sen. Ted Cruz is really all-in on defunding Obamacare or if he’s trying to put all the onus of defunding the bill on the House. The House outrage stems directly from a statement from Cruz and fellow GOP stalwarts against Obamacare in the Senate, Marco Rubio and Mike Lee. In it, Cruz said Senate Republicans simply don’t have the votes necessary to keep defunding language in the continuing resolution to fund the government after Oct. 1. Republicans have been attempting to push a bill that would fund the rest of the government while defunding the health care law, a bill Democrats have vowed to fight. “(Senate Majority Leader) Harry Reid will no doubt try to strip the defund language from the continuing resolution, and right now he likely has the votes to do so,” Cruz said in the statement. 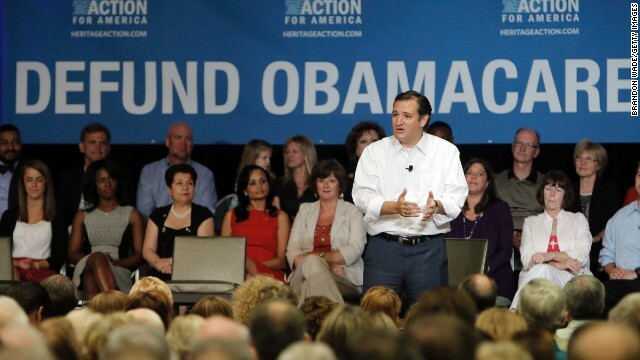 The idea that Republicans don’t have the votes to defund Obamacare is not new from Cruz. He’s spent the summer trying to build a “tsunami” of grass-roots outrage against the Affordable Care Act, arguing that such a movement would be the only way to kill President Barack Obama’s signature legislation. “They said nothing is impossible if you fight hard enough, and the minute the House announces the vote, they give up the fight? It's crazy," one senior GOP leadership aide told CNN. "They should walk the walk," the aide said, predicting it would backfire on the conservative senators. Another senior GOP leadership aide took a shot at Cruz declining to say whether he would filibuster the bill, telling CNN, "It is disappointing to see that Wendy Davis has more balls than Ted Cruz," in reference to the state senate Democrat who filibustered an abortion bill in the Texas legislature over the summer. Cruz's Texas GOP colleague, Rep. Blake Farenthold, said he hasn't seen the statement but heard a lot of grumbling from House Republicans on the chamber floor about it Wednesday night. “We gave them what they asked for; I was more hopeful they would be more positive about it and fight for it," Farenthold said. Farenthold praised Cruz as one of the most articulate legislators on the Hill and issued a challenge: "I think this a great opportunity for him to go to the Senate floor and win over some votes. Let's see him do the Rand Paul filibuster. He can do it, and I think he'll do a good job," Farenthold said. The Texas delegation has a regular lunch on Thursdays, and Farenthold said he hopes Cruz shows up tomorrow so they can discuss strategy. Cruz vowed late Wednesday night on Fox News that he and Sen. Lee "are going to fight with every breath in our body." "Today I think is a victory for the speaker. And indeed, I would make a plea today to the 46 Senate Republicans that today is the day for party unity that every Senate republican should stand with Republicans in the House, should stand with conservatives and should stand with the American people," he said on Fox's "Hannity." Lee, who joined Cruz on the show, said after the House passes the bill, it goes to the Senate and at that point, "we have to watch out for a few things." "First of all, we have to look out for those who will say that once we have had a vote in the House or perhaps once we have had a vote in the Senate that that's it. That's all we need. A vote equals a victory. There is a difference between a vote and a victory," he said. "And we have to remember that this will not be either won or lost with a single legislative volley from one side of the capitol to the other," he cautioned. "This, like so many other big legislative debates might well take several volleys between House and Senate." Lee added that he and Cruz "intend" to stand with their House counterparts in trying to defund Obamacare. Arkansas Republican Rep. Tim Griffin took to Twitter to tweak Cruz, Rubio and Lee, referring to a message from a reporter about the their original statement and tweeting "so far Sen Rs are good at getting Facebook likes, and townhalls, not much else. Do something. . . RT ..."
A spokesman for House Speaker John Boehner was more muted in his response. “We trust that Republicans in the Senate would put up a fight worthy of the challenge Obamacare poses,” Michael Steel said. Cruz aide Sean Rushton stood up for his boss when asked for comment on the GOP ire. A filibuster of Obamacare still hasn’t been ruled out, Rushton said. “All options are on the table,” he said. CNN’s Dana Bash and Ted Barrett contributed to this report. YUM !!! OBAMA'S boots taste great !!! Wake up republican sheep! Do any of you know any details of the ACA? Are you really ok with accepting YOUR politicians and "news" channels biased opinion regarding the ACA? Do some simple research for once and see how this LAW benefits YOU! Just put away your hate for Obama for 1 hour and you might see your country really isn't being destroyed by an evil dictator. Instead you will learn health care providers can no longer profit (as much) off of your "bad" health issues and they have to cover you where in the past, if you were going to affect their profits, they would drop you. Your beloved Fox "spews" is profiting off of the misinformation they feed you daily. You people hate everyone! Are you really concerned about the .2% of small businesses having to help with their employees health coverage? I doubt it! Your wonderful GOP is voting against your best interests, pull your head out and do something about it! Country men, women, please, if these nasty animals of GOP further talk of Obamacare, an epithet, please VOTE all these rethuglicans out in 2014. Tell it is the law of the land, lex loci to these people of non compose mentis thugs of this great nation, God bless us all. What I cannot understand, Cruz and most other idiots, in the House, when they walk in, they loose their minds, they are listening the the American People, as they are always touting they know what we want, apparently this man deaf, dumb blind and stupid. get over you lost the election in and wait until 2014 and 2016, you are going to loose big again because of stupidity.